Throughout the year, I will be fundraising with my professional business fraternity, Phi Beta Lambda, to benefit THON in an effort to provide outstanding financial and emotional support to children and families impacted by childhood cancer and spread THON’s mission world-wide. It is my hope that one day, every child will have the opportunity to live out their dreams. I first became familiar with THON's mission during my senior year of high school when a group of friends and I started a Mini-THON at our school. As many seniors had already checked out for the year, eyes set on prom, graduation, and beginning college, we worked tirelessly throughout the year to reach our $20,000 fundraising goal. With the support of our fellow students and our community, we were able to raise $21,025.52. Since 2015, Pennridge High School Mini-THON has raised over $160,500 for Four Diamonds. As soon as I got to Penn State, I got involved with THON as a Committee Member! My freshman year, I joined the Communications Committee where I helped to staff info booths during THON Weekend and disseminate information to student volunteers throughout the year. My Sophomore year, I joined the Donor and Alumni Relations Committee where I assisted in stewarding donors and leading tours of the Bryce Jordan Center during THON Weekend. Last year I had the opportunity to serve as a THON Captain for the Donor and Alumni Relations Committee! My specific position was Company Relations, which meant I got to personally build relationships with THON's donors, develop new fundraising initiatives and thank donors for their support. I enjoyed my last two years on DAR so much that now, going into my Senior year, I'm on my third trip around the DAR sun serving as the Development Communications Captain! I'm excited to apply my skills from my advertising and digital media trends and analytics studies to my position this year! I joined Phi Beta Lambda my freshman year and have been heavily involved in the organization. 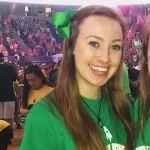 In addition to serving 2 years on the executive board, last year I had the opportunity to serve as one of our organization's THON Chairs, organizing fundraisers and events to spread awareness of THON's mission. This year, I will run my third half marathon with Phi Beta Lambda to raise money For The Kids and in memory of PBL's Four Diamonds child, Rees Parham. I truly appreciate any support you provide, either by making a donation or by sharing my page on social media to spread THON’s mission. For The Kids!